Specified complexity is the argument that evolution cannot explain how complex, successful organisms arose. 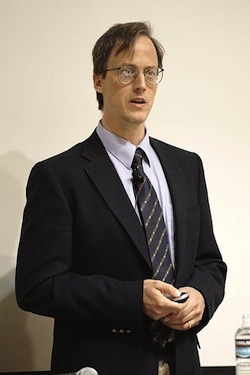 William Dembski is the main proponent of the specified complexity argument. Though he got the term from Paul Davies' book, The Fifth Miracle, he applies it to evolution where Davies only applies to to abiogenesis, the origin of life. How does the scientific community explain specified complexity? Usually via an evolutionary algorithm. ... But what is the relevant evolutionary algorithm that drives chemical evolution? No convincing answer has been given to date. Mutation is undeniable, and no one denies it, not even anti-evolutionists. The copying of genes from one generation to the next is not without error. There are changes in the genetic code between a parent or parents and it or their offspring in every organism. The theory of evolution proposes that natural selection works upon these random, chance mutations to preserve the ones that are beneficial for survival. Scientists debate just how much of a role chance plays alongside natural selection, but evolution is impossible without at least some selection. What is wrong with this evolutionary algorithm according to the specified complexity argument? According to William Dembski, it's not "convincing." There's no argument here. There's nothing but a statement by Dembski that he's not convinced by the theory of evolution. Later in his article, Dembski makes some statements that make it sound like he knows what he's talking about, though he's said nothing at all that means anything at all. He talks about the "appearance" of specified complexity, and says that this is all that evolutionary algorithms can generate. Then, to sound even more like a scientist using accepted mathematical formulas, he ends by saying, "Does Nature exhibit actual specified complexity? The jury is still out." This is all pretense. "Specified complexity" is not a real scientific term, and there is no official definition of it. There is no "jury" looking at the topic because the topic is all in Dembski's head. When real scientists discuss terms like "information theory," they are using a term that has been agreed upon for the sake of research. "Information theory," in mathematics, has specific formulas that have been agreed upon by mathematicians, and it has very specific application. Dembski has created his own version of information theory, agreed upon by no one, and he talks about it as though it has some kind of real application to real life when it does not. Dembski's arguments and formulas are his own. They are not the arguments and formulas of real information theory (see bottom of page). Now he has done the same with his invented term "specified complexity," pretending like there's some real science involved. Dembski wrote a book called No Free Lunch in which he attempts to define specified complexity with mathematical formulas, like real scientists would, except that real scientists would agree first on the terminology, then what formulas apply and why. Dembski has agreed with no one, just made up his own terminology, which sounds impressive to non-scientists, but which scientists think are just kooky. Having made this conclusion, does not mean that I condone this or any of Dembski's specialized terminology. I think that 'complexity' is a vague term with multiple conflicting definitions from many authors. It should be avoided. "Statistically significant" does the job just fine. That means that if only if Dembski says something is specified, it is. That's pretty useless of course. Later on he tangles it up with specificity, which is a terrible term. In other words, William Dembski has made up his own scientific language, which is completely useless. Worse, because he's inept, he's confusing it with other real scientific terms, and because he's putting on a show, he's pulling mathematical formulas from real scientific theories and applying them to his own invented and useless terminology. Schneider's article, quoted above (accessed 10/22/13). Talk Origin's refutation of Dembski's version of information theory (accessed 10/22/13). Google software engineer Mark Chu-Carroll (accessed 10/22/2013), who holds a Ph.D. in computer science, discusses Dembski's book, The Edge of Evolution. Warning, Mark is clearly irritated with Dembski's pretense and lets it be known. Here's an easy to understand blog on Dembski's ways (accessed 10/22/13). With both specified complexity and information theory, William Dembski has simply made up his own science with his own definitions using mathematical formulas out of context and incorrectly. This is effective for fooling the masses, but real scientists are appalled.